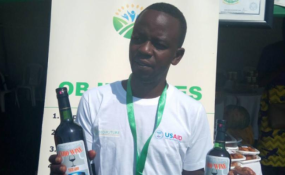 Marc Niyigeza, the current student in level 2 at the Independent Institute of Lay Adventist of Kigali (INILAK) produces wine from carrots. When Marc Niyigeza, a student at the Independent Institute of Lay Adventist of Kigali (INILAK) observed that carrots harvest time was characterised by increased supply into the market and most produce rotting away, he thought of a way to invest in value addition. The 30-year-old student from Kirehe District came up with an innovation to make the most of the produce. "The idea of adding value to carrots came when I realised how during harvesting season, the supply surpasses the demand especially around May leading most of it to go to waste. I started two projects; producing wine and drying carrots to produce edible carrot powder as an alternative storage techniques," he told Business Times. The innovator who is studying Business and Marketing at the university partnered with a colleague studying food science to boost his research. They started production in February this year (2018). "I imported a cheap processing machine at the cost of Rwf200, 000 from China and other few resources and then started producing. I started with juice from it but I found producing wine was more profitable. This gave rise to an enterprise; dubbed Genuine Innovation Factory," he said. Niyigeza said he works with farmers who use organic fertilizers to grow carrots. Although his enterprise is still at an early stage, he said he produces between 100 litres and 200 litres of wine per month depending on the demand. "We have started to sell to supermarkets and bars. When I am producing wine I employ about ten workers who walk away with Rwf 2,500 each every day. I also hire a professional staff in charge of quality control whenever we are producing whom I pay Rwf5, 000 per day. My enterprise is still young but it has been growing considering it has only been a few months since I started," he said. His innovation also benefits farmers as he buys carrots in plenty. He purchases one kilogramme of carrot tubers at Rwf500 during harvesting season and at Rwf700 when there is scarcity of produce. 240 litres of wine can be produced from 600 Kilogrammes of carrot tubers. "The wine production process between 30 and 40 days while the product has a shelf life of about four years," he said. The young innovator however told Business Times that to get to the desired production levels, he requires modern equipment that can produce quantities that meets consumers' demand. "If we receive so many orders, I am not sure if we can satisfy their demand. We still face financial capacity issues limiting us from buying modern machines to produce and meet delivery deadlines. As the business grows, I look forward to buying such equipment and rent a bigger operational place," he said. "Small enterprises are still facing challenges in terms acquiring quality approvals from Rwanda Standard Board, as it requires many elements such as better equipment, professional staff among many others. The standard board is training us under Zamukana Ubuziranenge Programme which will enable us meet quality standards, he added. "RSB tested our product and found there is no problem that is why we have been selected among the small enterprises for training," he said. In May this year, Rwanda standard Board (RSB) announced that in partnership with the Ministry of Agriculture and Animal Resources, fresh university graduates trained in standardization and industrial development will soon be deployed to support in improving quality and standards of foods and beverage processed by Small and Medium Enterprises. The new measures are informed by the fact that about 70 per cent of industries in Rwanda are agro-processing. An assessment carried out by National Industrial Research Agency (NIRDA) between July last year and February 2018 also indicated that 60 per cent of industrial foods from those agro-processing industries on local market are not certified for safety and quality because they are not aware of hazards control system.